Poland will support a draft agreement on scrapping the visa regime between Russia and the EU, Russian Foreign Minister Sergey Lavrov said following a meeting with his Polish counterpart Radosław Sikorski. President Dmitry Medvedev passed the document to the European partners at the Russia-EU summit in Rostov-on-Don earlier this year. “We hope to get a prompt and positive response from Brussels. The Polish side has confirmed that it is going to support the project,” Lavrov told a media conference on the results of the meeting in Warsaw, cites RIA Novosti. The foreign minister also noted that the relations between Russia and Poland – which had been rather tense for years – are currently on the rise. To some extent the April 10 Smolensk air crash, which killed 96 people including Polish President Lech Kaczynski, has helped the two nations to reconcile. “The reason for that is not only the Smolensk tragedy that truly united our peoples,” Lavrov said. It was also thanks to peoples’ desire for building good neighborly relations, he added. 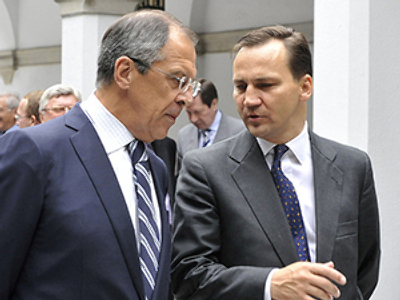 Another sign of warming in the relation relations, RadosÃ…â€šaw Sikorski has promised that Warsaw will give its backing to the “Partnership for modernization” initiative proposed at the Russia-EU summit in Stockholm in 2009. He said that both Russia and Poland have chosen a path to modernization. “We are glad that our countries have the same understanding of the modernization. It includes not only technical and economic development, but also an improvement of social-democratic mechanisms,” Sikorski said.